We love superheroes don’t we? 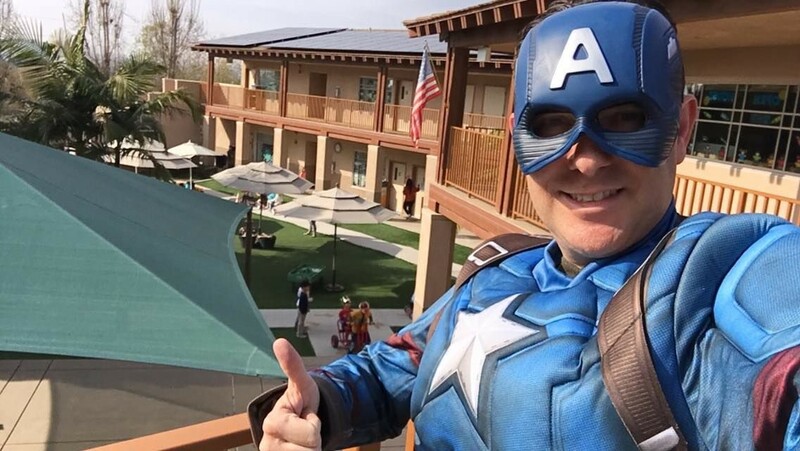 I recently dressed up as “Pastor America” and visited the little kids at our school. They were duly impressed. It’s interesting that the world so readily latches onto the idea of someone stronger, faster, and more powerful than us who can step in battle the evil villain. Whether it’s Star Wars, Lord of the Rings, Marvel or whatever… we seem to be insatiable when it comes to dreaming about this battle of good vs. evil – and in particular, the power of good to rescue us from the power of evil. Where’s that come from? It’s actually rooted in Truth. In History. In Reality. In the Bible. Spielberg, Lucas and the others get this idea from the Bible, whether they realize it or not. The Apostle Paul warns the Christians at Ephesus, and us. Speaking to the young pastor Timothy, the Apostle Paul warns that some of the people in his church had fallen into the “trap of the devil” and that he had “taken them captive to do his will.” (2 Timothy 2:26). This doesn’t mean that the devil possessed those believers, but that he had set traps for them, and they walked into those traps, unwittingly doing the will of the devil. An interesting thing about our sin is that God uses our sin to get us to repent and turn to Him. He desires to restore our relationship with Him as He forgives our sin. The devil, on the other hand, uses our sin to cause us to distance ourselves from God in shame, and even turn away from belief in God, turning to false religions. Paul told Timothy The Spirit clearly says that in later times some will abandon the faith and follow deceiving spirits and things taught by demons. – 1 Tim. 4:1. Finally, while I believe the devil cannot possess Christians who have the indwelling of the Holy Spirit, through faith and baptism (see: Acts 2:38-39, 1 Corinthians 6:19), I do believe that he can harass and oppress Christians, and that he readily does. Scripture is full of stories showing the activity of the forces of evil against believers and unbelievers alike. (See Matthew 17:15-18). But what we always see in Scripture is that God is more powerful than the devil. Jesus is always able to cast out the evil spirits (Matthew 17:18). They must always obey Him! In fact, they recognized Jesus and His authority over them before even Jesus’ own disciples did! (see Mark 1:24). The demons are well aware of the power of the Son of God over them. The question is are you? Do you realize how powerful the Name of Jesus is over any power of the devil or darkness? Do you realize the miraculous authority over darkness that you possess as a follower of Jesus who bears His Name? When people at our church are baptized, we give them a candle lighted from the flame of the candles on the altar. We tell them that this light symbolizes the Light of Christ that has come into the world … and the Light that they now carry into the world as a follower of Jesus. What I don’t think we often realize is just how powerful that Light is over the darkness. Friends, if you and I are in a spiritual battle – that cannot be fought with flesh and blood. Then the only way we can “take our stand against the devil” (Ephesians 6:10-18), is to call upon the Name and the power of Jesus. This is the authority that is given to us, and which we take up when we put on the Armor of God. Imagine a frail elderly person who has been commissioned as a crossing guard at an elementary school. They do not possess the power within themselves to stop a moving car or truck. (Nor does any mere mortal, for that matter.) But the stop-sign that they have been given in their role as crossing guard gives them the authority to stop those moving vehicles. They simply hold up the stop-sign, and the operators of the vehicle recognize their authority and stop. It’s the same with demons and the devil. When you and I call upon the Name and the authority of Jesus, the powers of darkness must obey! What spiritual battles are you facing right now? Don’t be surprised if that relationship struggle, or that challenge at work really has an invisible spiritual battle being waged underneath – a battle for your inner peace and joy, if not for your very faith. Don’t let the enemy trick you into trying to win that battle in your flesh. Do what you can in the earthly realm, for sure. But turn over the spiritual battle to Jesus and His angels to fight in the spiritual realm on your behalf. If you’d like to hear my recent sermon on “Miracles of Deliverance,” click here. Before my sabbatical began I wrote an article explaining more about what a sabbatical is, and how I intended to spend the time I was away. To give focus to this time of renewal I gave it the theme of “ministry reimagined.” I explained that this meant I wanted to look at how our current patterns of ministry may not be serving the outcomes that we intend, nor the purposes for which God has gathered us together and sent us out. And then following that prayerfully seek and discover new or modified (reimagined) ways of doing ministry that would be more fruitful. In this article I hope to share some of what I have been discerning, understanding that all of life and ministry is a work in progress. “God’s not done with us yet” … as the common expression goes. This just means that we always need to keep open hearts and agile spirits that are willing to be redirected along God’s paths as we move throughout life. In fact, we need to do this anyway because life and the world are always changing around us. We may be doing nothing wrong, but God needs us to do a new thing simply because that is what’s needed now. We all know that culture has moved in so many ways. Along with this, we need to recognize that how people experience the unchanging Truth of God’s Word, and the Love of His Son Jesus changes too. Notice – the Truth doesn’t change. God doesn’t change. Jesus doesn’t change. But the ways in which people encounter and experience them do. fewer meetings, more accountability. Often we hide behind the fact that we “had a meeting to discuss.” Not only does this consume valuable time and energy, but it limits what we can do by tying it to the meeting schedule. Better is to use fewer meetings to establish more effective goals, and then better accountability for the completion of those goals. less ambiguity, more clarity. Lack of clarity leads to confusion. Confusion leads to frustration – which leads to ineffectiveness. Whether it is regarding goals, or the authority and resources to accomplish those goals, we need to capture our plans and communicate them with clarity. less hierarchy, more teams. The more layers of complexity that an organization has the harder it is to get things done because decisions are always getting pushed up the food chain. Rather than filling seats on boards and committees, we will focus on smaller functional teams. less busywork and more discipleship. The teacher enters the room, and unexpecting students do what? Look busy! God didn’t give us the Great Commission to “go and be busy,” but to “go and make disciples.” We need to get laser focused on making disciples by creating intentional steps for everyone to grow spiritually. less ritual and more discipline. Many of the rites and rituals that we practice were birthed out of basic spiritual disciplines such as prayer, study of the Word, self-examination (which leads to repentance), fasting, service and gratitude. But we are in danger of keeping the forms and losing the substance. The challenge for us is to re-train our hearts to the purposes for which we have rituals in the first place. less focus on externals, more focus on creating culture. Have you been in a restaurant with ornate decorations, but lousy service? That’s an example of focusing on the externals but failing on the culture. We need to first create a culture of disciple making and spiritual care – then the externals can follow. Culture is usually not written down, but it ebbs and flows through every little thing we do. People sense culture immediately even if you never talk about it. Less information, more transformation. Have you heard of this thing called the internet? People have access to more information than ever before. And they have it instantly at their fingertips, any hour of the day or night. What people are hungry for is not more information, but life transformation. Therefore we need to discover ways of helping people put God’s Word into action in their life. This begins with Sunday morning first, and then builds off that. less surface, more connection. “How are you?” “Good.” That’s surface. We must do better to truly connect to the wonderful people that we are passing by – starting right in our church first. less isolation, more inclusion. It’s obvious, but you won’t connect with others if you stay in your safe shell. People today are lonely and isolated more than ever before. Our phones and our fancy cars and homes all contribute to this isolation. Church is to be a place that’s different. We need to call people out of their hiding into our welcome embrace. less hiding, more outreach. Interestingly, as a church, we hide well too. We put on some great programs and events, but who knows about them? Do we even really want them to come? We need to come out of our shell and seek to widen our circle of influence and connection. less “causes” and more community. When we do reach out, often it is because we want bodies or helpers for our cause. We bang the gong and say, “come join us!” But we aren’t really interested in relationships with those people, but increased numbers in our army. I am using harsh terms, so you can clearly see the difference between the two. less obscurity, more identity. I wonder if we don’t hide, because we don’t know who we are and what we’re about. Can we express our identity in simple words so that we can communicate it to others? less peddling, more providing. Often we decide what we think the community, our neighbors, even our members will want. Then we “peddle” that product on people – trying to sell them on what we’ve decided they need. Better is to be in dialog with them to listen and understand what they need, and then lovingly and graciously provide that. In the latter case, no “peddling” required. less worldly, more Kingdom. Kingdom wins often don’t look like much to the world – and vice versa. This is a simple reminder to us of who we are trying to please. God smiles when lost sinners turn to Him. But He also smiles when saved sinners are faithful in their marriages, generous in their tithes and offerings and humble in their service. less flesh, more Spirit. To do these things, we cannot simply “try harder.” Unless the Lord builds the house, the builders labor in vain – Psalm 127:1. We must start from the inside out – transformed by God’s Holy Spirit that dwells in us through faith and baptism. As we walk with Jesus each day, we offer ourselves as His hands and feet; allowing Him to guide, direct and work through us. less talk/analysis, more action. Two popular books by local Christian authors have these simple titles “Love Does” and “Do something.” Get the message? Jesus taught us that Love cannot sit idly by. You and I cannot be satisfied to talk about what we ought to do, but seek rather to allow Christ’s Love to shine through us. We are going to heaven, that’s settled. But until God calls us home, He wants us to be bearers of His Love and Light. less lukewarm, more passion. There’s a reason that the book of Revelation warns against lukewarmness. The opposite of which is passion. Christ’s suffering and death has been called His “Passion.” Lukewarm won’t lead one to sacrifice and die for the sake of another. Passion will. As Christ followers, we are passionate about what He is passionate about. fewer people in Hell, more in Heaven. Jesus told us what He was passionate about. He came to find lost sinners (Luke 19:10). He longed to gather them as a mother hen gathers her chicks (Matt 23:37). We must recognize that judgment day is coming. People will live forever – it’s just a question of where. May there be more souls in heaven on the Last Day because of what we do today. What do you think, is that ministry reimagined? I hope it gives you a handle of the work I believe that we have in front of us to become the kind of church God desires us to be. And I pray that it encourages you to be a part of shaping the future of our ministry together. I am excited to begin working with you as we further explore and flesh out these concepts. There’s much work to be done. But thankfully, God hasn’t called any of us to do it alone. He has gathered us together in a community of brothers and sisters with Christ as the head of our family and the bonds of the Holy Spirit uniting us together in one mystical union – the Body of Christ. May we be transformed by Him and faithfully carry out His work until He calls us home. Last month I provided you the first half of a framework to help you “re-imagine” your part in the ministry that God has called us to. In that study, you considered the ministry we do as “Us with Us.” Since we cannot give away what we do not have, our ministry must first be faith-strengthening and life-transforming among ourselves before we hope to minister to those outside our church. It is my prayer that we will take to heart what the Scriptures say about how we worship, grow and serve with our church family, such that we experience the powerful presence of the Holy Spirit working amidst us. Then we can turn our sights outside of our church and invite others into our loving & Christ-centered fellowship. This month I encourage you to search the Scriptures and consider the ministry we do as “Us with Others.” I am including here a study based on resources from our friends in the Southeastern District of the LCMS (se.lcms.org). You can go through these on your own, or even better, with others who are part of your church family! Read the following verses silently, then pause and re-read them circling the words that catch your eye: Acts 10:34-42, Matthew 28:19-20, Acts 1:8, Mark 16:15, Romans 10:13, 14, 2 Timothy 4:2, Acts 13:47, John 14:6. Why did you circle the words you did? What issue was threatening to divide the 1st century church? What lessons do we learn from the 1st century church that we can apply to the 21st century church? Read Luke 15:11-32. Read it out loud, pause and let each person read it on their own, read it again out loud. Have each person circle words or acts described in the text that caught their eye. What does the parable of the “prodigal son” have to say about the work of reconciliation? Have each person share one time they tried to reconcile with someone and what happened. If we believe that because of sin everyone needs to be reconciled to God, what are things we can do to help them be “reconnected” with God? What may be the obstacles to that reconciliation? How long do we have to try? Discuss what the role of an ambassador is in our world today. How does that apply to us as Christians? What does Paul mean when he says, “God making his appeal through us?” What implications does that have for living out our lives with others? List 3 people you think either were, or yet are, “ambassadors for Christ.” What was it about them that made you list their name? Assign the following verses to individuals asking them to read, reflect and respond to what the verses have to say about our being an “ambassador for Christ.” Philippians 3:20, Ephesians 6:20, 1 Corinthians 11:1, Romans 1:16, Galatians 2:20, Colossians 1:13. Other changes that you can think of? Discuss the above list and how they are being seen in our congregation. Rate those listed above with 1 being the most challenging to our congregation and 5 being the least. What gives you hope in living out your faith in the church? What makes it difficult?? L- Learning from someone. Learning how to listen to their story, asking questions like “help me to understand,” and moving beyond what we assumed or thought we knew. E- Engage. Listening and learning as if you really care about them, paying attention to what they are saying. S-Share. Finding opportunity to share the message of Christ’s love. Read 1 Peter 3:15. Have each person write out their own faith story considering the following guidelines: Concise, without quoting bible verses, Non-judgmental or threatening, Non-defensive or critical, Inviting, welcoming, loving. In pairs, have one person share their story with another and then reverse. Those listening may ask questions putting themselves in the place of someone who is curious but cautious about Christians. Share in the larger group what you learned. Whether you work through these lessons with others or by yourself in your own devotional time, my prayer is that God’s Spirit will help you grow in Christ’s love for others in the Body of Christ (Us with Us) – and then lead you to engage people outside of the church (Us with Others) – your friends, neighbors, coworkers and family. May God increase all of our ability and desire to share His love with the people around us. As I wrote in last month’s blog, I think it’s a great idea that while I am on sabbatical for the months of July & August, refreshing and renewing my perspective on ministry, that you use this time to do the same. Over the next couple months, I want to provide you a framework to “re-imagine” your part of the ministry you belong to. In July, you will consider the ministry we do as “Us with Us.” And in August, you will consider the ministry we do as “Us with Others.” As has been said, we cannot export what we do not possess. Our ministry among ourselves first must be faith-strengthening and life-transforming, before we hope to minister to those outside our church. To understand what healthy “Us with Us” ministry is all about, I encourage you to search the Scriptures. I am including here a study based on resources from our friends in the Southeastern District of the LC-MS (se.lcms.org). You can go through these on your own, or better, with others in a small group! Now ask the Lutheran question, “what does this mean?” What insights does Luther give into vocation, or calling? How does Luther change that thinking and how does it apply to us today? Read these sections of Scripture and discuss/consider what they say about “calling”: 2 Peter 1:10-11, 2 Timothy 1:9, 2 Thessalonians 1:11, John 15:16, 1 Peter 3:9, 1 Corinthians 1:26, Ephesians 4. How do we use our calling to serve others in our congregation? Discuss this quote from Luther and how it applies to working for unity within a congregation. What makes unity in a congregation difficult? What helps us to overcome the difficulties? Why was unity in a congregation so terribly important in the 1st century? Why is it just as important in a congregation today? Look at the different gifts that are listed in these texts. How would you describe these gifts in today’s language? Consider the others in your group, or in our congregation, and name some of these spiritual gifts that they have. What examples would you offer in how these gifts are being used in our congregation? Have you taken a spiritual gifts inventory? If not, consider taking the next “Discovery 301” class – where an inventory is administered and scored for you. Read Ephesians 4:12-14, and paraphrase in your own words. How has your faith stayed the same since your baptism? How has your faith changed since your baptism? What things get in the way of improving your faith life? Would an accountability partner help you? Talk to others in your group or at church and tell them one of these “fruits” you see at work in their life. Offer specific examples. Which of these “fruits” do you think is one you need to work on the most? How could we help members of our congregation to grow in faith? Was the spiritual growth of everyone in a congregation important in the 1st century church? Is that same community growth more or less important in the 21st century church? Review the list of activities that the early Christians did together (vs 42-45). While they are all important which would you rate as most important and why? What were the results of their being together in mission? What were some of the challenges that they faced and how did they overcome them? What are some challenges that our congregation faces and how can we work to overcome them? Whether you work through these lessons with others or by yourself in your own devotional time, my prayer is that God’s Spirit will help you grow in Christ’s love for each other (Us with Us) – as you search the Scriptures to see how God calls us to relate to those in our church famly. And then next month as you focus on how God calls us to engage people outside of the church (Us with Others) – our friends, neighbors, coworkers and family – that God will increase your ability and desire to share His love with the people around you. May God’s Word renew and refresh you! It got here quickly – my ministry sabbatical. The elders approved a sabbatical for me, back in February of 2017. However, given a number of critical ministry concerns including a significant staff reduction as well as the strategic Mission Advancement and Implementation process that we began in late 2016, that sabbatical was postponed until July-August 2018. And now it’s almost here! But what is a sabbatical and what does it mean for our ministry at Redeemer? This article will try to address that. As I mentioned in a recent sermon, a number of people have told me that I have “earned it” or “deserve it.” I know that the thought and sentiment is good, but my typical response in to say, “thank you very much. But the truth is, I *need* it.” I am truly grateful that the congregation is affording me the blessing and gift of this time away, but the reason that our synod and districts recommend regular and intentional sabbaticals for their pastors is because what has been observed is that the regular and sustained demands and pace of ongoing ministry have a cumulative effect[i]. After periods of four to seven years, there is a very real need for a season of rest, recovery, and renewal in order to maintain the energy, focus and emotional and spiritual health that are necessary to lead a congregation – especially in these challenging times. In the well-known, and often referenced, The 7 Habits of Highly Effective People, the last of the seven habits is often overlooked, but can become the most impactful if neglected – “Sharpen the Saw.” Just like a carpenter or lumberjack must work harder and harder when their tools get dull, so must ministry leaders. At those times, it takes determination and intentional effort to stop work, halt the production line, and tend to the care of the tools. However, it is far better to stop working with dull tools for a moment and return refreshed and retooled, than to continue forging ahead with ineffective tools. Otherwise what ends up happening is that eventually the work will grind to a halt as the tool becomes completely dull or broken altogether. The analogy is clear. What Happens During the Sabbatical? What Does this Mean for Redeemer? “Ministry Reimagined” is my theme for this Sabbatical. And I am applying that to our congregation as well. It’s not uncommon for pastor and congregation to follow similar trajectories. I believe that Redeemer also finds itself in a season of needing refreshing and renewal. And I believe that our congregation can benefit from using this Summer as a chance to receive from, be nurtured by and be refreshed by God. But even moreso, I believe that both pastor and congregation will benefit from using this as an opportunity to “reimagine” the ministry that God has called us to in this place. Just as I find myself in a season of being stretched too thin and regularly engaged in a flurry of activity, that while good, doesn’t seem to be accomplishing those things that God ultimately desires for His people … so too does Redeemer find itself in a similar season, wouldn’t you agree? It is likely that we find ourselves in this place because of how we’ve “imagined” God desires us to accomplish His will in this place. It’s possible that we’ve placed our effort, our attention and our resources on doing the urgent rather than the important. It’s possible that we’ve actually been working out of our own strength, will-power, knowledge and abilities (the flesh), rather than relying on God, seeking Him and walking with Him in the Spirit. What both pastor and congregation need to do is to reimagine how God wants us to do ministry together, with Him. This is in fact what the Mission Advancement and Mission Implementation Teams been working on – setting up a construct for us doing ministry together in productive Spirit-filled ways that align with the ministry calling that God has given us. In other words, not just “doing ministry” but intentionally focusing our efforts on being the people that God has called us to be and doing what He has called us to do. To do this we need clarity on who we are at Redeemer, what we are doing in our ministry together, how we are doing it, and most importantly why we are doing it. That’s ministry reimagined. I am excited to begin sharing with you what God has been laying on my heart, and how He is directing the leadership of our church when I return in September. Also at that time, we will begin a bi-weekly time of gathering, growth and shared “imagining” of what our ministry is all about. These meetings are open to anyone, but ultimately are for those who want to be used by God in ministry at Redeemer. Together we will allow God to melt us, mold us, and reshape us to better reflect His image in this place. That’s ministry reimagined. Santa Claus, The Tooth Fairy, The Boogie Man, UFO’s … these are all things I used to believe in. Well, maybe I still do believe in UFO’s a little! 🙂 It’s funny for me to think of things in which I used to put my faith, that ultimately hold no power, and are not real. I wonder how many people today put their faith in things that are not real and hold no power – and yet they believe in them? With just a moment’s thought one can come up with a hearty list of false gods in which people trust. It ranges from money to tummy. Oh how much better for us as Christians! We put our faith in God who continues to reveal Himself and demonstrate His power on a regular basis, and has done so for millennia. The Reformation of 1517 emphasized and brought clarity to this very important tenet of doctrine – that we are saved by grace, thru faith alone! … Sola Fide in Latin. But what do we mean when we say “faith?” In what (or better in whom) do we place our trust? And what does that then mean for us? That will be the topic of our new message series starting in May – “Daring Faith.” When you and I dare to believe it means that we will not only find comfort and peace through what we believe, but we will find the strength to rise to new challenges that results from that faith! God asks us not just to believe … but to put our faith into action. Said another way, if we believe something it should affect the things that we think, say and do. Certainly our knowledge that the Son of God entered our world to live and die for us, but rose from the grave and is alive and reigning on His throne in heaven, should prompt us to live with a confidence and hope that affects our actions. Let us not settle for merely daring to believe – but for daring to let our faith affect our life! On Easter Sunday this year, we discussed what we believe about Jesus – His life, death and resurrection; and why we believe it – the evidence and testimony revealed and recorded in the Bible. Now in this series we will discuss how this faith changes us – transforming the way we view and interact with our world! May 20 – What Happens When You Have Faith – We will learn what happens when we see with eyes of faith instead of eyes of fear. May 27 – Daring to Give God My Best – We will learn from the Biblical examples of a soldier, an athlete and a farmer how to give our very best to God. June 3 – Daring to Imagine – We will learn how our imagination and our faith work together to cause us to dream “God-sized” dreams and imagine the world the way that God already sees it! June 10 – Daring to Commit – We will explore our deepest needs in life, and the importance of making commitments in each of these areas. Doing so will strengthen our faith and our relationships with others. June 17 – Daring to Plant in Faith – We will look at God’s laws of planting and harvesting. From them, we will learn that our relationships, our health, our finances, our careers, and other areas of our life follow the same laws. June 24 – Daring to Wait on God. We will learn what we need to remember when we’re in the waiting room of life. And we will learn what to do while we wait. We will find that even our waiting is being used by God. Back in my younger days I was a “junior” volunteer fireman. Which basically means that since I wasn’t an adult, I couldn’t actually fight fires, but I could assist and learn. I spent most of my time washing fire trucks, spooling hose, sweeping the truck bay, and participating in parades in the summer time. But when not doing that, I had begun to learn how to hook up hoses, operate the pumper truck, wear “turnout gear” and even how to use an air-pack if required to enter a burning building. College and career ended up taking me away from my hometown and moving me to communities that had professional firefighters. And while I never had to put my life at risk in order to rescue the life of another, I gained an appreciation for those who do! Ours is primarily a rescue religion. This Scripture teaches that Christ rescued us from this “present evil age.” I take that to mean that He didn’t just rescue us from ourselves or our own sin, or even just from the attacks of the devil, but He rescued us from the sins and attacks of other people, and in fact from all evil that assails us in this entire present age. We are under the curse of sin brought on us by the first sin in the Garden of Eden, and that curse pursues until this very day. But Christ has rescued us from it. In fact, He not only rescues us from the curse of death, He promises us eternal life in a new age, in the eternal Kingdom that He Has ushered us into! By His death He has won eternal life for us undeserving sinners who would otherwise eternally perish. This is truly a rescue, is it not? Christ has rescued us from the clutches of hell, and when we share this “Gospel” (that Paul so adamantly defends in his letter to the Galatians) with others we, in effect, rescue them. In fact, this has become the mission of every Christian – to share this Good News. By saving us from death, Christ has now commissioned us to join Him on a rescue mission. He came to seek and save that which was lost and headed for death. So we now participate in that mission. April 8 – Overview – As His followers, Jesus calls us to be witnesses—to tell our stories. We don’t have to be experts in theology or know all the answers about the Bible, but we do have to be willing to tell people why we believe, and how we have been changed by the hope that is in us. April 15 – Connect – It may seem obvious, but if we never connect and spend time with people who are far from God, it’s going to be impossible to introduce them to Jesus. Jesus set an example for us by hanging around with people who needed Him, and He calls us to do the same. April 22 – Serve – Jesus told us to love God and love others. Love, however, is often misunderstood. To simply say that we love others, but never cross the room to serve them may ring hollow. When we serve people, we show them that they are unique individuals who are loved by God and loved by us. April 29 – Share – Just meeting physical needs, however, is not sufficient “rescue work.” God asks us to be bold, and to share our own faith experience and knowledge. We must be ready to state clearly and simply how Jesus has changed our lives. May 6 – Grow – Having a relationship with Jesus should change us. The Bible tells us that we are to be transformed – not merely self-improved. As disciples of Jesus we are to develop daily habits that help us grow to be more like Him. 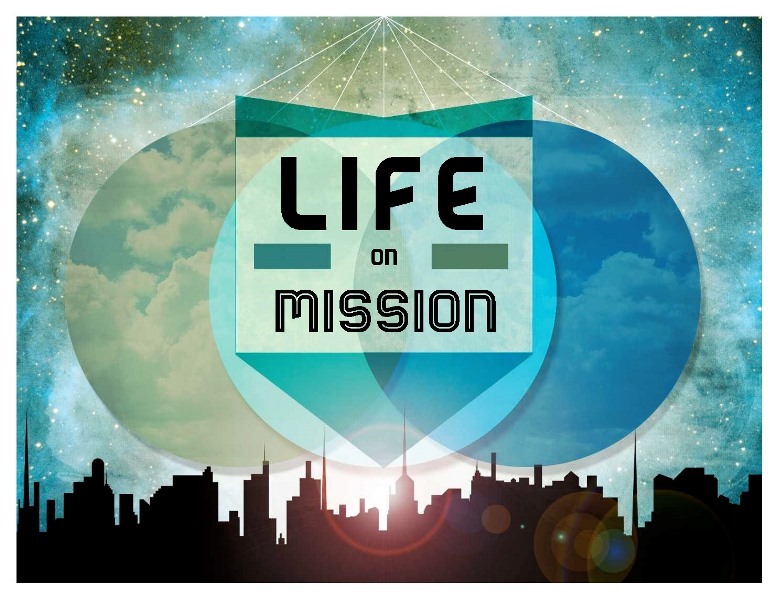 May 13 – Pray – If we are on a mission to connect, serve, share, and grow, doesn’t it make sense that we should stay in communication with the One who is sending us out? Prayer is how we stay connected to God, and is the source of our power and strength we need for our rescue mission. No Word From God Will Ever Fail!